Our love for natural dyes finds its roots in concerns for our artisans, our environment and passion for the craft and natural hues. In 1856, while searching for cure of Malaria, William Henry Perkin discovers the first synthetic dye stuff and a new industry was born. Natural dyes, which can be traced back as far as 2400BC during the Egyptian periods began to disappear. 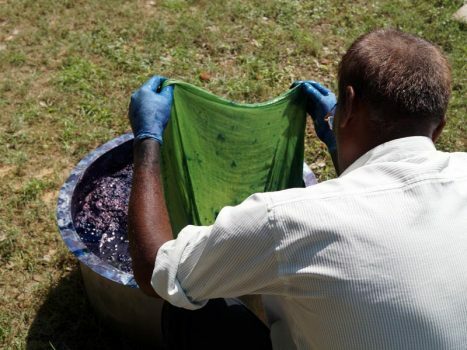 Nowadays, environmental and societal issues linked to synthetic dyeing are bringing natural dyeing back into the sunlight. In the United States, cancers, cerebrovascular and lung diseases leading to deaths amongst dyers are – 40 times higher, for some diseases – than in the general population. In India, governments regulations aren’t necessarily applied and honest audits are scarce. Manufacturers fighting for international orders are always looking for ways to produce cheaper. Workers are the first to pay the costs. Cancers, birth defects and respiratory diseases are rampants in villages around dyeing plants. Rather then be a part of the problem, we wanted to make sure none of our workers or their families, anywhere in our supply chain, would suffer from making our garments. Which is the first reason why we got into natural dyes. Unfortunately the negative externalities linked to chemical dyeing do not stop there. It is now said that the unnatural blue hue of some rivers in China can be said from space. Chemical waste from dyeing plants are being rejected into our environments around the world and particularly in countries without proper governmental supervision or technical means to ensure their proper treatment. Chemical dyeing poisons workers, their families, our air, our soil and our rivers. 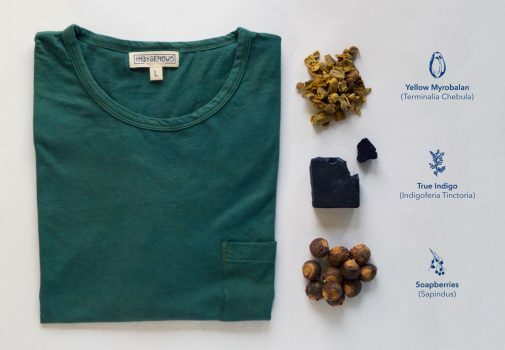 Our choice for natural dyes is not limited to side effects of chemical dyeing. We love natural colours. With colours coming from roots, nuts, flowers and fruits, we achieve hues impossible to synthesise. One of the most pleasant surprise we had working with natural dyes was the realisation that all of the colours we developed were matching beautifully with one another. They’re all present as is in nature, and we aim at putting them back in your clothes. The first step in natural dyeing is bleaching. Once our fabric is weaved, it is the fibre’s natural colors and it contains dust and dirt residues from the weaving process. To make our fabrics Ready For Dyeing (RFD) we use a herbal bleaching process which consists of several baths of hot water mixed with tamarind, soapberries and wooden ashes. The next step will consist in preparing our dyebath. A dyebath is a mix of water, dyestuff (a substance yielding a dye, or that can be used as a dye), and a mordant (used to fix the color onto the fabric). To each color it’s own dyestuff, and hence it’s own dyebath. The dyestuffs we use the most are Terminalia Chebula for our yellows, True Indigo for our blues and Common Madder for our reds. While True Indigo does not require a mordant, all of our other colours do. To fix our colours to our fabrics, we use Alum. Alum is fairly easy to extract from natural sources and has been used as a mordant since antiquity. Water, dyestuff and mordant makes our dyebaths. The actual dyeing consists in diping Ready For Dyeing fabrics into a dyebaths, and repeating the diping until reaching the required shade. Since our process is entirely natural and harmless for the environment, we use the water left in the dyebaths after dyeing to irrigate fields surrounding our facility.